Dysosmia hircina Sweet ex M. Roem. Passiflora foetida var. glabrifolia Miq. ex Triana & Planch. Passiflora foetida var. hastata (Bertol.) Mast. Passiflora foetida var. hirsuta (L.) Mast. Passiflora foetida var. nigelliflora (Hook.) Mast. Passiflora foetida var. sericea Chodat & Hassl. Passiflora foetida var. variegata G. Mey. Passiflora hibiscifolia var. velutina Fenzl ex Jacq. Passiflora marigouja Perr. ex Triana & Planch. The stems are thin and wiry, covered with minute sticky yellow hairs. Older stems become woody. The leaves are three- to five-lobed and viscid-hairy. When crushed, these leaves give off a pungent odor that some people consider unpleasant. The flowers are white to pale cream coloured, about 5¨C6 cm diameter. The fruit is globose, 2¨C3 cm diameter, yellowish-orange to red when ripe, and has numerous black seeds embedded in the pulp; the fruit are eaten and the seeds dispersed by birds. Edible fruit. The fruits are kumquat sized and contain a bluish-white pulp that is mildly sweet and delicately flavored. In the Philippines, the fruit of Passiflora foetida are known colloquially as Marya-marya ('Little Mary') and Santo papa (due to its resemblance to the Pope's mitre). Young leaves and plant tips are also edible. Dry leaves are used in tea in Vietnamese folk medicine to relieve sleeping problems. 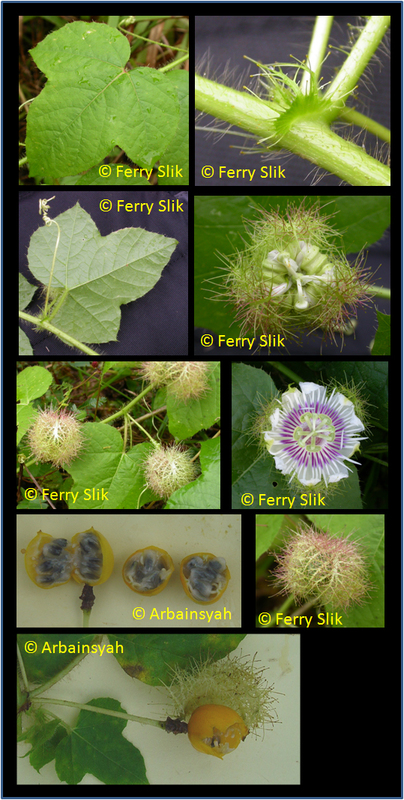 Passiflora foetida contains high levels of saponins and is used as a substitute for soap in the manufacture of (soap-free) detergents. Native to Southwestern USA to South America. Introduced in most other tropical regions of the world.